I knew that my pot luck repertoire was sorely lacking the first time I brought ravioli in tomato-basil sauce. I'm a Jersey-Girl, raised with wonderful Italian cuisine on every corner. How was I to know that, to most people, ravioli was something that usually came from a can? I quickly got my pot luck act together deciding "Middle America" works best. If I wanted to impress people with my culinary skills, I invited them to dinner in the rig. The masses get mass-pleasing food. The other thing we learned about pot lucks is to get the biggest plate you can find. Our first experience at a pot luck was at a New Jersey Good Sam rally. I was completely surprised by the number of people who had opened a can of pork and beans and dumped it into a dish for their contribution. I also learned that these were the people with the biggest plates. We had average-sized paper plates, figuring we could get enough to eat on them and come back for more if we were still hungry. Stop laughing! There is one opportunity at a pot luck and one has to seize it. The next time a Camping World catalog came to the house we ordered those cafeteria-sized divided trays. We bring them along with a salad-sized paper plate for desserts. We still call those Camping World trays "The Good Sam plates." Friends of ours are great eaters. They purchase disposable trays at Sam's Club for their pot luck forays. Pot lucks are wonderful opportunities to sample regional dishes and I've learned about some unusual foods and cooking techniques from attending them. 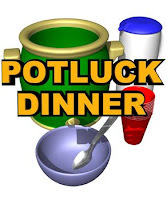 I've collected some awesome pot luck recipes over the years and I’ll be sharing them over time. Here's one that is very easy and even those who think ravioli only comes in cans will be impressed with it. It's white and most people will try anything the color of potatoes. Cook pasta in boiling water as the package directs and drain well. Place in a casserole dish and add Alfredo sauce. Stir gently. Top with cheese if desired. Carry it into the pot luck and wait for the compliments. Awesome site.. thanks so much for your thoughtfulness.